The Floyd Speedway will open this Sunday. To celebrate the opening of the speedway there will be a 200-lap race featuring Curtis Turner, Ted Swain, and Glen Wood. Copyrighted material - for Virginia Tech educational use only. 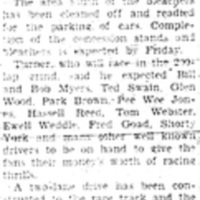 The Floyd Press, “Floyd Speedway Will Open Sunday with Two Races,” Virginia Tech Digital Humanities Omeka, accessed April 25, 2019, http://dhomeka.lib.vt.edu/items/show/3.